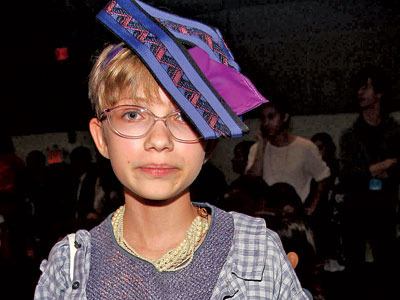 For the longest time, I’ve tried to figure out the fashion industry’s obsession with 13 year oldÂ Tavi Gevinson. She initially got attention by her daring ‘far beyond her time’ outfits, but as far as I can see– it ends there? I mean, she hasn’t even finished High School or a formalized writing class- so I’m not sure if people are looking at her as a fashion authority or credible writer? Somehow, she has become a media darling & is now flown around the world to take meetings with Marc Jacobs / Rodarte /Galliano & etc. It kind of upsets me when things like this happen- because published/accredited writers/media get pushed out of fashion week shows so they can accommodate people like this! Well, I guessÂ my new heroÂ Sarah Mower from The Telegraph feels the same way. Â Check out what she has to say below! Come on Girls, Give Us Some Attitude! Have you read her blog? She’s a widely read and well-written author with a very authentic and interesting literary voice. Though she is young, her credibility as a writer comes from the fact that she is heavily engaged in the act of WRITING and, by nature or against convention, is also a very fashion-minded individual. Nobody is knocking her sense of fashion. However, I pose this question to all ‘writers’ out there- just because you have a blog, does it make you an authority? Does it validate your skills? You can be widely read & well written, but does that mean you deserve front row over people who write about fashion for a living? As someone who has worked in the fashion industry for quite a while- I think she is a pawn. Once the media uses her for all she’s got & she gets a little older- what happens then? I don’t hate her becuase I don’t know her personally. But to be perfectly fair and honest, not only do I not find her writing to be spectacular I don’t even find it to be particularly good. She’s just an eccentric kid who got very very lucky. your definitions of ‘author’ and ‘literature’ worry me greatly. Oh please – well read at 13??? Perhaps by fashion industry standards. This kid is a novelty and it is p-a-t-h-e-t-i-c to see these moronic adults treating her like the second coming.